Helen celebrated her birthday on the 1st May and I made these cupcakes for her to celebrate again with her scrapbooking friends this morning. 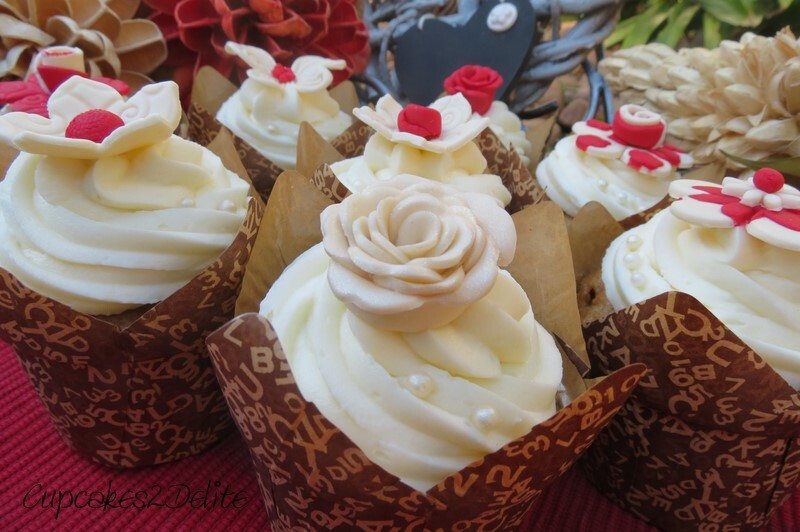 I had delivered cupcakes for another customer 2 weeks earlier and Helen fell in love with the cream and red decorations on those cappuccino cupcakes. 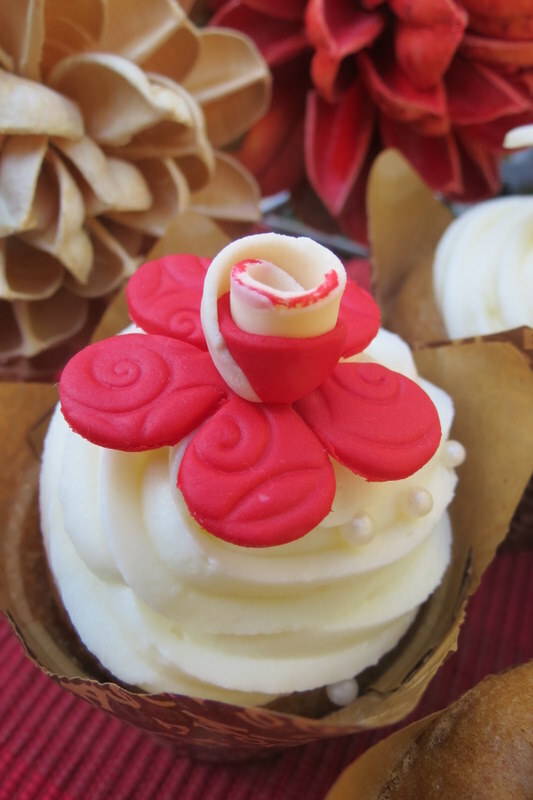 She asked me to do the same cupcakes for her which I did but with a different play on the red and cream flowers. Helen is a very beautiful elegant woman and I wanted the cupcakes to portray a little of her and her personality. 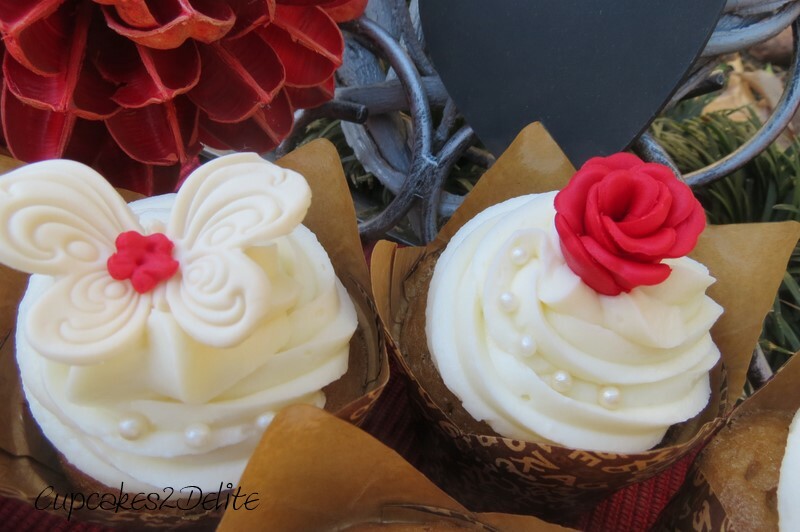 I made cream sugarpaste butterflies with a small red blossom accent and then small sugar paste roses and embossed cream flowers with an embossed centre. I embossed a 5 petal blossom and then made a rolled rose with a mixture of cream and red for a contrasting and different centre. 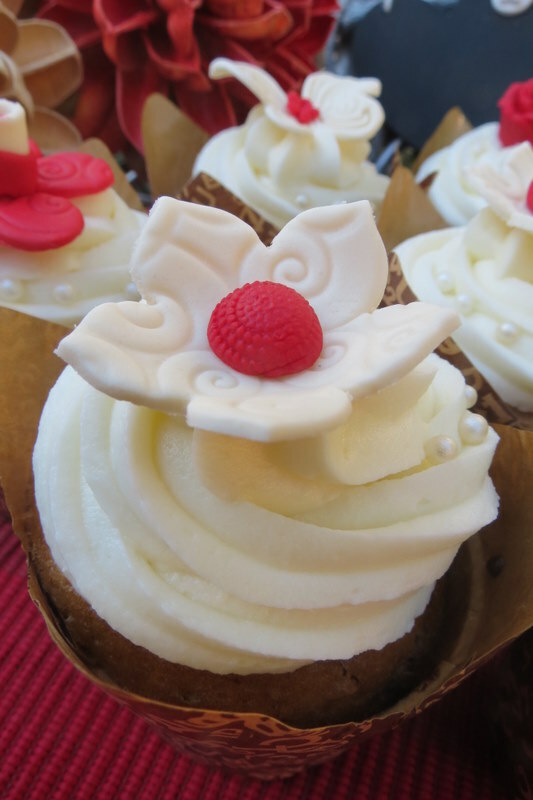 As all scrapbookers love pattern I added miniature red blossoms to a larger cream blossom and pressed them into the sugar paste, adding a rolled rose for the centre. For the last contrasting flower I pressed a medium red daisy into a larger cream blossom and then added a small cream daisy for added dimension. I hope you had fun celebrating with all your friends Helen and as usual it was a pleasure to make these cupcakes for you. ← Musical Flower Birthday Cake! Lisa, the attention to detail in your cupcakes are phenominal. As is usual everyone loved them and Helen really enjoyed her birthday. Thank you for adding to the magic of her day. Took some more photos with the birdie house which I will email to you. You are welcome and I can’t wait to see the photos you took!